The Magnetic Sand Timer is an elegant, impressive accessory for your desk or kitchen. Tip the timer and the iron filings inside react with the magnetic base to create a different magnetic sculpture every time, or use without the base as an ordinary 1 minute timer. Measures approximately 6 inches tall. 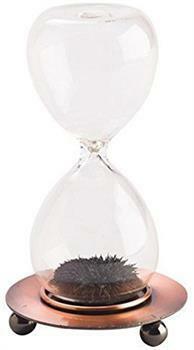 The Magnetic Sand Timer is an elegant, impressive accessory for your desk or kitchen. Tip the timer and the iron filings inside react with the magnetic base to create a different magnetic sculpture every time! Use without the base as an ordinary 1 minute timer! Measures approximately 6 inches tall.